"Buying at Tax Sale Doesn't Work!" Thanks for subscribing to my "Go Ahead, Be a DeedGrabber!" Mini-Course. You're about to learn about one of the least known, but most profitable niches in real estate - DeedGrabbing. Over the next 5 days I'm going to debunk many of the myths about tax sale investing, and show you the "loophole" that allows anyone to profit from tax sale properties, without investing a bunch of money or waiting. I really get a diverse group of people who subscribe to this email course. Some of you are just getting started and have heard that tax sales are the best opportunity to get real estate for pennies on the dollar - even free and clear properties for under $1000. If I'm talking to YOU now, I'm about to save you a lot of time, frustration, and money. Others of you are modestly successful, own some properties already, and maybe even have done some creative or pre-foreclosure deals. You're looking for another, more profitable niche to pursue. And I get people now and then who are experienced tax sale investors. If you've invested at a tax sale before, what I'm about to tell you is not news. Whatever the case is, I'm sure you'd like to make money in the tax sale arena, and you recognize that now is the time to get bargain purchases. And you're looking for a way to do it. Direct tax sale investing is not a good way to acquire bargain property unless you have hundreds of thousands of dollars to invest, and are willing to wait months and months, or years, to acquire your properties. This is because you will have to face other bidders at a tax deed auction or buy dozens of tax liens and wait to get one that results in a property acquisition - most tax liens pay you off and leave you with no property...though you do usually earn a nice rate of return. TAX LIEN SALE - The county allows investors to "purchase" unpaid taxes. An investor pays the taxes owed, on behalf of a delinqent owner, and is given a first-priority lien on the property. The investor earns a high percentage return on his investment if the owner pays him off (quite often, it's 10-20%+ per year). A deadline is set for the owner to pay off the lien. If the owner fails to pay this amount by the deadline, in most states the property is deeded to the investor free and clear. TAX DEED SALE - A sale date is set for all properties with delinquent taxes. Anyone who has not paid by that date has their property sold to the highest bidder. Each state's law is different, but your state should be similar to one of the two formats. On the face of it, it appears that bargains would be everywhere. Simply pay off someone's taxes, wait a while, then acquire their property for just the tax amount. Or bid on their property at the tax deed sale and get it for the amount of taxes owed. 1. Many states have a bidding system for tax liens as well, so tax liens for valuable properties will be bid far past the minimum amount. 2. If you manage to buy a bargain tax lien, you will be paid off by the owner 95%+ of the time. 3. You will have to wait many months or years to acquire the property and there are legal pitfalls throughout the process. 1. 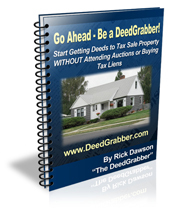 Tax deed auctions are well known, and well attended by investors. They will bid up the price on valuable properties to near retail value, or certainly to 70-90% of value. 2. You need all cash in hand at the sale. Tax lien investing is great for people who want to park large sums of money making double digit returns, and end up with a bargain property once in a while. In fact, large institutions come in and spend millions of dollars on tax liens at one sale, in my county alone. "OK, I'm Convinced...What About the Loophole?" Sorry if I've burst your bubble about making money at tax auctions. But here's the good news: there's a loophole that gets us around all the downsides of attending tax sales to buy liens or deeds. We're going to get $200 properties like those folks on TV (though the properties might not be as pretty as the phony pictures shown on the infomercial). We're going to get them now, and use the loophole: we're going to buy directly from the owner who is about to lose the property. 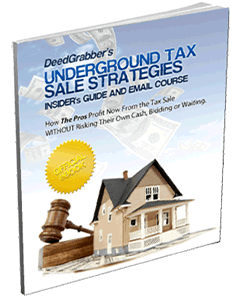 "The Real Source of Tax Sale Bargains - The At-Risk Owner"
I'm retured with little money so how did you get started ? That's the way I got started too. But you have it even better because now a lot of counties have delinquent lists online for free that you can start with. If you really need to operate on nothing for a while, you could locate the properties reaching the end of the tax sale process, find owner phones online, and start calling them to see if they would be interested in getting something out of the property before the tax auction or foreclosure. Then you're 99% of the way there. where did you get delinquent tax list & the peoples phone numbers you say you called? You can find a lot of delinquent tax lists online free. Pick a state, google for a list of counties, then start googling each county "county name tax sale list" - many will have them posted online for free with tons of information. For peoples' phone numbers, try intelius.com and other free searches online. Do I still get all the bonus stuff if I sign up now from this site. Also what forms are included with the E-book Do I have everything to do my first deal. I would also like more info about doing a 50/50 deal with you. lets face it i have looked on m counties web site and there are many properties to buy but all are still expensive. There is a copy of a quitclaim deed and several purchase agreements. Realistically you will need a title company or attorney from the local area to get you going with your closing paperwork but the purchase agreement should get you started anywhere. Once you have a deal verbally agreed to, or signed up, contact us with the details. It has purchase agreements and sample deeds. To get all the paperwork I typically use, plus the ebook in written format and 3 audio/DVD's, plus over 10 hours of no-fluff conference calls, grab the customer appreciation pak after your ebook purchase (you'll be offered it). Is Quit Claim Deed the only option? I believe the best deed to get is Grant Deed or Warranty Deed. Besides, after training through your e-book, could I expect some concrete results (I mean decent money) say in about 90 days.. Thanks. No, warranty deed is an option too. But quitclaim and warranty deed give you the exact same ownership in the property. A warranty deed was also include a warranty from the seller that title is clear. We're not asking them to do that when we only pay them $100-$200 for the deed. When you pay a significant amount for a property, yes, get a warranty deed and it will make sense that the seller warrants that the property is clear. Of course get a title report too. Yes it does, that's why I advise waiting until you've checked all sources yourself. You can get it from a title company or googling, you can get one online but make sure they're a "Real" company. Is this a technique that I can use to purchase a home for us to live in? We want to move to NJ but the homes there are very expensive. Please advise. It possibly could...but many of the properties we obtain need to be sold off to a rehabber because they are in poor condition. If you're willing to fix a place up while you live in it, it's a possibility. I've encountered many houses that would have been OK to live in but they're the minority. What is there is somthing wrong with the title should you still get the quitclam deed? Sure, if you can fix that problem and end up with good title. Sometimes you can buy a property very cheap because something is wrong with the title, and then you fix it relatively easily and resell with good title. You also might want to get a deed to it if it's headed to an auction where bidding occurs. As owner you might be entitled to any excess bid above the minimum. Thank you for your very quick response . I have one more question let's say I have a quick claim deed to the property and the property goes to a tax deed sale auction and a over bid did occur. As the holder of that quick claim deed I am entitled to what ever overage there is from that auction right? My question is the same as Vincent's question of October 1st. If you are the owner of the property at the time of the tax sale, then wouldn't you be entitled to any overages that occurred from the sale? The property would have been "free and clear" when it sold, right? So there should be no judgments, liens, etc. on the property for you to be concerned with, correct? 3. If there were lienholders of any kind, they usually CAN collect ahead of you. The liens were wiped out against the property for the new owner. They still make the lienholder an "interested party" to the surplus funds and courts have consistently awareded them the surplus ahead of the owner. This is, nevertheless, a great strategy. You just have to make sure you're working in the right state, making numbers 1 and 2 no problem, and then you just have to be aware the lienholders might come forward to claim. This almost never happens though in my experience. Thank you for your quick response. I live in CA. Is this the "right state" to do this with? I was wondering have you or any other of your students had any success with the strategies that you are telling us about in new york city? I had ever attempted to work in NYC. Until recently, students had issues with getting public records there. 4. Lots of properties and population. How is Connecticuit as a Tax Sale location to work with. I don't have any direct experience there - but I don't know of a state that isn't potentially good to work. Connecticut has pretty decent property values, I know that - not a lot of areas with worthless properties, if any. Work some of the more working-class towns. How can you find out if a property has an IRS lien on it? Thank you. There is no uniform way of doing this that I'm aware of. In my county, there is a computer terminal you can use to check, but only in person. Also, I believe many times the liens are recorded with the county, so you can just look up the seller's name and see if any IRS liens have been filed. IRS liens are one of the items that I don't feel comfortable researching myself in a new territory, and one of the reasons I would get a title report before investing much in a property. Yes, in Michigan the properties are ALREADY lost to the tax sale by the time the sale occurs - so the tax deed sale list isn't useful. Is NJ a state where you can find overages? I understand the interest rate is bid down in NJ, so that would make it less attractive to bank investors right? so is there any overage opportunities in NJ? There are no tax sale overages in NJ. Luckily, the business can be worked in any other state from wherever you live. There is likely no "inventory" of properties, any worthwhile properties would have sold immediately at the sale. There's no free lunch - you're not going to find properties on hand with the county or selling cheaply at the sale. The way to do it is to contact owners of the properties when the list comes out for the next sale - before the sale occurs - and cut some deals with them! I live in a redeemable deed state and I have purchased several deeds there. I can see were this would be grate to do after the tax auction in a redeemable deed state. I'm going to research this more. I lost the bids on so property I wanted. I maybe able to grab the deed before the drop dead date. Silvino here in CA, thank you very much for you time invested, teaching us your students,You now I red a ton of staff about really state from 4 or 5 guys out there, and I find your material very educational and helpful. Please have a big hug from my family to your family.and a big hello to all the students out there. Sure! Tax lien state where you can operate much like Indiana or other tax lien states. My county says they don't release the next tax sale list which is a depository sale until January and the sale is in February. Is that month the time slot you are talking about when I would send my letters out to the sellers ? Not familiar with a depository sale but that sounds like a leftover sale of properties that didn't sell before? I've never had much luck with those. Better maybe to find other counties that have action going on now. Is Florida one of the states where you have to have the property when it became delinquent in order to receive excess proceeds? Or, can I find an owner, cut a deal and record the deed 2 weeks before deed sale and be entitled to excess proceeds? By the way, I thought only federal government and local municipalities judgment and liens survived deed sales in Florida. Yes it is, they just changed that. You used to be able to do what you're talking about until recently. However, you could have them sign something says any excess proceeds belong to you, and also get a power of attorney from them for collecting any proceeds. Then you could collect as their agent and they've already assigned any funds to you they might be entitled to, so you just keep them. Not legal advice...just something to get you thinking creatively. Thanks for the advice/hint! I really did not think I'd get a reply, let alone this soon. The POA seems like a great way to go. I was once a loan officer so I've used a POA in the past. You're also correct by stating how not to always worry about what can't be done, just find a way to get it done. That easily separate the haves from have nots. Rick, I would like to know if most of the States that you deed grab in have in their Statues a code that states that AFTER the notice of seizure is posted by the county, that if the owner moves, sells the property, attempts to move or sell property, or assist anyone will selling the property is guilty of a gross misdemeanor? I currently assist with recovery of Excess proceeds, but am venturing into Deed Grabbing. I live in Las Vegas and this is posted in the NRS code: NRS 361.535 section 2 paragraph (B). Would not want to put myself in any position to be sued or have legal action taken against me for transferring ownership ( quitclaim deed) on a mortgaged / non mortgaged property. Thanks for any input on this. I am not aware of any law like that but haven't invested in NV. I guess my statement would be obey it! Just make sure you understand it. At first glance many laws seem to shut us down but when read carefully they only apply to owners who LIVE in the property when you come along, and who REMAIN in the property or are given a promise to be able to buy it back. We haven't done business like that for a long time anyway, so didn't affect us, and many/most of the properties we buy are not owner occupied. I think you have to be mistaken about the NV law. So in other words, if I get a notice of seizure as an owner (I can still pay taxes at this point and retain the house, right? ), and I want to sell it so I can get something out of it and pay my taxes, I can't? Couldn't be. If a notice of seizure is posted and that means someone else has already bought my house at tax sale and I've lost it, then I suppose I SHOULDN'T be trying to sell it at that point since I'm not the owner! How can we find out if the property owner has filed a Bankruptcy or there is a mortgage on the property? Is there any benefit of grabbing these properties deeds? Not really - we're usually looking for free and clear properties. Most are, any mortgage companies would have likely paid off the taxes to stop the foreclosure by the late states of the game. Is Wisconsin a good market as it is a Deed state? Also if we get a contract for a house dont we want to make sure it doesnt go to an auction so we can resell for more money? Yes, any state can be a good market with the right deal cut with the owner. And yes of course you would want to sell or redeem the property before it goes to the auction or you'll lose it yourself. to have the felling of it I did purchased a tax delinquent sale for $4.600.00 and I bid 60 % that means the owner have 40% of the deed? what if he decide to not pay again, at the end of redemption period? do I loose my money ? I think I made a big mistake bid at 60% . he put a sign __for sale on the house last month ,P.S.-your system deed grabber works here in R.I.? There's no reason it shouldn't work anywhere properties are being lost to tax sale. If the owner is putting the house up for sale this is a clear sign that he's trying to pay you off so it will likely redeem and you'll be good. There aren't many houses I know in RI worth under $150-$200k, right? Wouldn't you want to own 60% of a $150k house for $4600? That math works for me! I'll buy you out immediately if you get deed and don't want it, if it's a house. I'm not too familiar with RI but you sound like you're in good shape to me. If you purchase a deed prior to the tax deed sale trying to get the excess funds from the auction, does the foreclosure of that deed go in your name? If yes, doesn't that hurt your credit with the foreclosure? No, foreclosures affecting credit and other personal finances occur when you borrow on a mortgage from a bank, sign a note to pay the balance and fail. Not only have you not done that here, but the foreclosure is from taxes not a mortgage. So, no it doesn't. However complicated situations can arise that leave you in a bad spot if you own these properties in your name, such as liabilities at the property, building liens, and other things. So if you pursue this strategy (it's a pretty good one) just buy things in an entity so you can walk away if something happens. I just get a regular old LLC in my state, there is no secret to entities that I know of. Talk to an attorney if you want to know more about that. It is never a good idea to own real estate in your name except your home or properties you get a mortgage on, in my opinion, because too many unexpected liabilties can occur. Please call 800-242-5410 for options we have. What if you wanted to use it, to find a home for yourself?? It's possible but most of the homes you'll find need to be rehabbed heavily - best to sell these off to rehabbers and use the money to buy something.